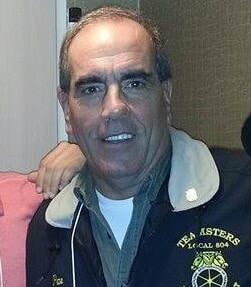 I am Pete Mastrandrea, a member of Local 804 for over 39 years. I have dedicated my life to representing the members of this great union in various leadership roles. I was a shop steward from 1981 to 1994. I was appointed by Ron Carey in 1993 to be a trustee for the international while he was president, wherein I was placed in corrupt local unions that were no longer working for the members. I removed entire executive boards in order to begin rebuilding those locals. I brought charges and returned the locals to the membership. In 1999 I returned to the feeder department and our local armed with more knowledge and experience. Later, I was twice elected to serve as vice-president of Local 804. Charge one: Failure to inform the membership about vacation pay that was owed to most of the former board. I repeat, all we were obligated to do was inform the membership, not seek approval. I want to make clear that this payout was for vacation time that was not taken during a 6- year period. If we were being accused of taking pay for vacation that had been used their charges would have merit, but it is payment for accrued unused vacation. In fact, there were many times I was on vacation and still came in to handle a 72 or attend an important meeting and did not receive additional vacation nor are these instances even included in the weeks I was paid out for at the end of my term. The president determined that it was the new board’s responsibility to inform the members at their first general membership meeting, as he had done 6 years prior when reporting the same payments to the Redmond board. The Local 804 bylaws state that the president interprets the bylaws , and officers are entitled to carry up to 3 weeks in any year and accrue up to a total of 9 weeks. If payment for vacation is considered extraordinary it must be reported to the membership. Because we had four less people on our board than the current board, and because we were dealing with countless issues including a broke health fund, a pension fund in the red zone and under 64% funded, national and local contracts, the company fighting us every step of the way, and more, we often were forced to skip vacations. We felt this was part of rebuilding our local and serving our members much like when we took office and cut the salaries of every eboard member by approximately $35,000 per year saving the local 2.3 million dollars over our 6 years in office. We also did not get paid for any unused sick or personal days, nor did we take all of the holidays allowed under the IBT constitution. I want you to understand that I never disrespected any of the current executive board in any way and I wished them all the best upon taking office. Not once did I receive even a phone call from them before I received correspondence from an attorney, who we later learned was a convicted felon. Do you now see the bogus charge we are faced with ? You be the judge, I trust your judgement. Charge two: Failure to tell the incoming board about any extraordinary payouts. The payment of vacation pay owed to us was not extraordinary and was required by state law. It is my understanding that the incoming president was in fact told about the payments and replied “ok”. The incoming board made no objection until the Hoffa lawyer saw the payments and created a bogus charge against us. The fact is the incoming board had no knowledge of the inner workings of the union and still to this day do not. That’s very disturbing. I am proud of my reputation and my name, and I will do everything in my power to clear it. I cannot believe the stories I am hearing, throughout the local, about this board’s lack of knowledge and experience. They have made Hoffa’s dreams come true, while disgracing the legacy of Ron Carey. Thank you for reading this explanation and I hope you see how we are being treated and express your outrage to this pathetic bunch of losers that we have leading our great local union.